Have you dreamed of hosting your wedding, family reunion or corporate event in an authentic Red Barn set amidst a stunningly beautiful, river valley and mountain landscape? 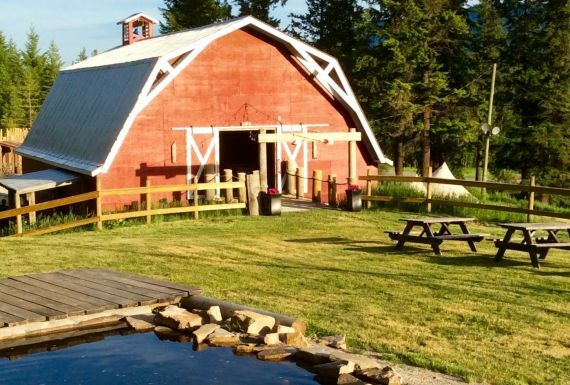 The Columbia Wetlands Outpost Red Barn is a charming destination for parties large and small. It is located on our working farm and has been lovingly restored to maintain its original feel with a host of accent features and modern amenities to make the day special. Events Booking : Booking for this year (2018) is now CLOSED. Further event bookings are pending Agriculture Land Commission's decision, anticipated Fall 2018. Feel free to check in with us anytime to get an update. We are happy to help you plan your special occasion, just let us know what you are thinking !